In a network infrastructure, devices use several protocols to communicate and transfer data. SNMP is one such protocol that aids in network monitoring and management. The earlier versions of the protocol—SNMPv1 and SNMPv2—had security vulnerabilities that led to attacks and data breaches. In fact, some organizations have set standards that prevent the usage of SNMPv1 and SNMPv2 entirely. In order to protect sensitive data, SNMPv3 should be enabled. In a network that houses several devices, manually enabling SNMPv3 in every device would be time-consuming. However, with Network Configuration Manager you can easily automate the process of enabling SNMPv3 in all your network devices. Authenticity: SNMPv2 only notifies users when messages are delivered. On the other hand, SNMPv3 ensures the messages' privacy and also that they are sent from an authentic source. Integrity: SNMPv3 ensures that the data received hasn't been tampered with during transit. Encryption: The data is scrambled and is encrypted so that it is no longer in human-readable format. SNMPv3 can be configured manually with the help of a terminal emulator like PuTTY. Each device has to be configured individually while using PuTTY. In a network that has several network devices, configuring SNMPv3 in each of them would be time-consuming. With a tool like Network Configuration Manager, such network operations can be automated with high precision. Configlets are executable configuration templates that help you automate repetitive and complex network operations. You can easily set up SNMPv3 in your network devices with the help of configlets in Network Configuration Manager. You can create configlets to suit your device and network requirements. 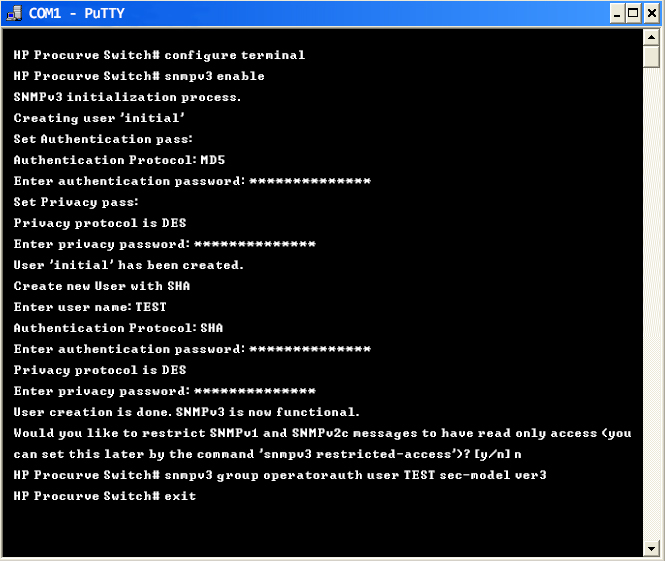 Shown below is an example of configuring SNMPv3 in an HP switch using Configlets.